We do not believe in cutting corners. We produce all our work in house to ensure we know where our products come from. We believe in using of the best materials. Although experts all have their favourites, we use Shofu porcelain and their composite materials, including Ceramage. Ceramage contains 73% by weight of micro-fine ceramic particle, which are embedded in an organic polymer matrix and combines the advantages of ceramic and composite to give a light-curing “esthetic” composite for use in any indication. This composition increases the homogenous structure resulting in optimised physical properties and enhanced esthetics. Ceramage combines natural color reproduction with extraordinary strength and elasticity and is recommended for conventional cases as well as implant restorations. 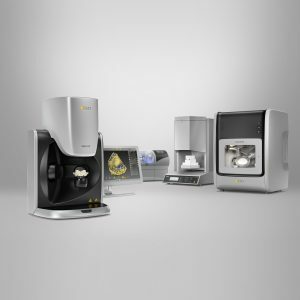 In the last 12 months, we have decided to upgrade our CAD/CAM capabilities to the inLab system from Sirona Dental. This Scanner and Milling Machine combination will allow us to design and manufacture Crown and Bridge work in a variety of materials, all in house. Here at Sean Rush Dental Lab, we are very excited about this development and look forward to using it for years to come. The inLab family of products from Sirona, some of which are featured in Sean Rush Dental Lab.